Are now up and can be reviewed by clicking here. Note: The last time the BETS generated a -70 "sell" reading, after making new all time closing highs on a weekly basis, was on January 18, 2008 - 14 weeks after those highs were seen on October 12, 2007. This time around its been 16 weeks since the last weekly all time closing high which came on May 15th. Both high points are basis the New York Composite Index. Wasn't BETS on a "sell" since July 15th? Price pattern wise at the close this past Friday, it seems as though we are at about Feb 5, 2008 on a daily chart at a decent retrace of the first rally attempt off the bottom. That BETS of -70 in Jan 18, 2008 was one day before the closing low for the next 6 wks of dead cat bounces before we slipped into a more sustained decline. Any thoughts on how it might play out this time? The BETS moved to an "Accumulate Shorts with Protective Bullish Stops (above market)" signal the week ending July 3rd (-35) - the same time we broke below the rising trendline in prices since the October 2014 lows on the NYA. This was also the first such signal since 10/3/14 which led to the October/November corrective sequence. The July 17th signal (-25) was the technical snapback to the neutral zone (hold shorts), which then subsequently failed, and we then moved to a "Accumulate Shorts with a Bearish Bias" signal having gone to a lower BETS number than that of the July 10th reading of -45. Those signals then would be part of a corrective sequence of a longer term uptrend until we actually got this week's "Sell" signal telling us that there's now enough money moving out of the markets that the directional trend for prices is likely to move lower for the intermediate term. Below is the longer term historical chart of the BETS (since inception) showing how the market reacted after the January 2008 sell. As you mentioned, the market held up and showed a nice snapback rally to what was the previous rising bottoms line before eventually having the 2008 crash. Notice also that like this week's signal, the January 2008 signal complimented a break of the longer term rising trendline of that bull market sequence. Ideally, we'll may see the same thing this time around as well, but the bottom line is that the BETS is telling us that we have to trade based on bear market "environment" rules as opposed to bull market "environment" rules until we move back to above a +20 reading. In 2008 there was still a ton of technical repair work that the market needed to work through to arrive to where it is today. The BETS rightfully raise red flags at this point in time, but since you only have 10 years worth of data, the question presents itself whether there is sufficient and significant statistical data to draw definitive conclusions from historically. The NYA trendline if drawn on a simple arithmetic scale remain intact and once touched it triggered the immense late August rally. Yes money has been moving out of the market, but wouldn't any real correction worth its salt have money move out the market to refresh the advance? Please temper your bearish outlook, and lets see if the bull market can prove itself once more. My guess is yes it will. With the biggest difference being that short term interest rates have yet to rise where as the FED moved rates up for 3 years from 2004 to 2007. Watching the Libor and TED Spreads of late though does suggest that this maybe changing sooner than later, and the market might be adjusting to this new way of "doing business". In 2008 there was still a ton of technical repair work that the market needed to work through to arrive to where it is today. 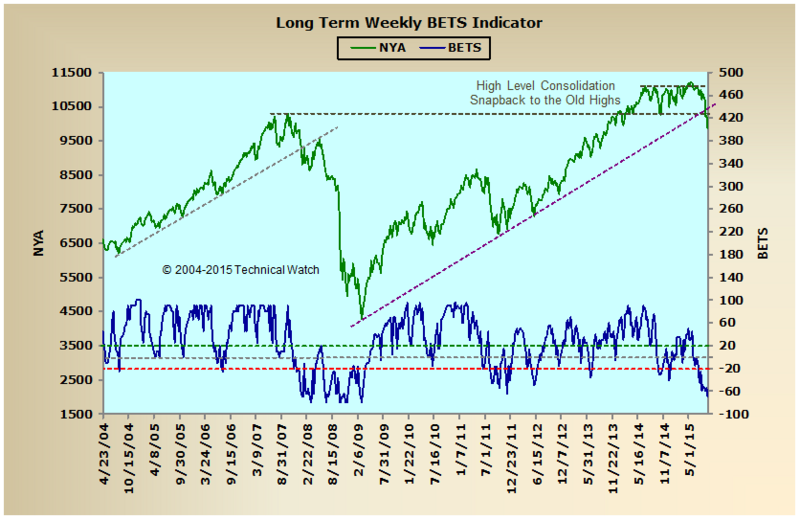 And we shouldn't underestimate the bearish technical condition of the current market either. Remember also that many of the breadth and volume MCSUM's have been above their zero lines for a historic amount of time...in some cases, for over 18 consecutive months, and in the case of the Ratio Adjusted NYSE MCSUM, it's been been above its zero line for much of the last 6 years without an extended period below the zero line. That, in and of itself, highly suggests a prolonged time below the MCSUM zero line in order to provide longer term technical market balance. The BETS rightfully raise red flags at this point in time, but since you only have 10 years worth of data, the question presents itself whether there is sufficient and significant statistical data to draw definitive conclusions from historically. Very true...and the last 10 years has been during an extended time of unorthodox monetary policy procedures provided by the Federal Reserve, no less, outside global central banks "copy cat" policies which makes us no longer sovereign in this respect. The NYA trendline if drawn on a simple arithmetic scale remains intact and once touched it triggered the immense late August rally. Yes, but the last two weeks have been reflex rallies off of our being a deeply "oversold" marketplace from the 8/24 crash lows....very much taking your forearm and sloshing the water back and forth in a bathtub, taking your arm out of the water, and then letting the water settle on its own. Up until today, we didn't have anything to suggest that a bottom was being created except with the high TRIN numbers of over 3.00 on 8/21 and 8/25, and then the 5.00 reading on September 1st. For now, we're locked within the confines of a simple symmetrical triangle configuration with the buyers looking to find their sea legs. Yes money has been moving out of the market, but wouldn't any real correction worth its salt have money move out the market to refresh the advance? Not with gold, oil and commodities making new lows of their own unlike that of the 2007/2008 period. This could suggest a "deflationary crisis" of some sort, and current cumulative money flow configurations are not consistent with past correctional sequences that we've seen since 2011. You might be right, but I would be doing a disservice to anyone who reads my posts if I wasn't consistent and pointed out the obvious. That said, we have seen many times over the last 5 years where underestimating this market's strength has gotten you in a lot of trouble as well. Could be one of those times, I guess. But then again, it's our job as technician's to respect and follow what our indicators say and let time sort out the details later on as to the why's and wherefores. Thanks for your detailed explanation above. Much appreciated. In reference to your reply to Rightfield, you referenced the symmetrical triangle that the whole world has been watching. What is your take on the apparent "failed breakout" on Fed Speak and follow through failure on Quad Witch Friday? 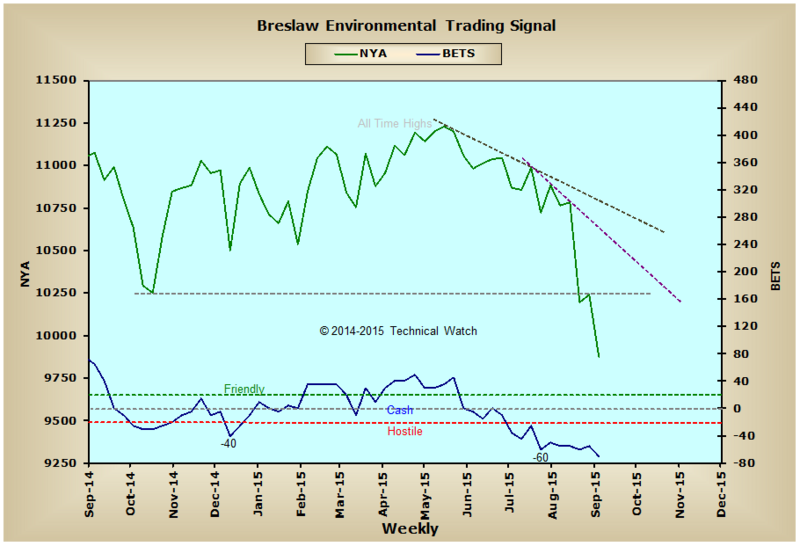 Looking with bullish glasses on, the NAAD and NYAD remain above the recent early Sept highs. NYMO and NAMO made new yearly highs SINCE the Oct 2014 highs and have complex patterns above the zero line. Looking with bearish glasses on, and recognizing that volume was huge due to options expiry, still the NYUD made an impressive lower low for the month. There are of course, several other bearish technical factors but this one jumped out as a new one on Friday.